The monsoon rolls in bringing a record number of players out to play during Season 2 of the ILG! Looking back at the month we see additions to games played, huge prize pools taken home and a busy month in the June meta breakdown. The month of June has seen the highest number of games being played this season so far, with 683 matches being played in seven different games. With 16 cities and 23 cafes playing host, we can look back at June as a very busy month with Overwatch and Rainbow Six Siege hitting the ILG competitive scene. Indian LAN gamers are continuingly exceeding all expectations by signing up in higher numbers than ever before, as June has seen 1,867 gamers compete for a prize pool of 12,36,500 INR. FIFA reins supreme again, with 462 gamers signing up for FIFA18 this month. Team attendance is strong with 260 teams signing up over the 6 games being played other than FIFA18. 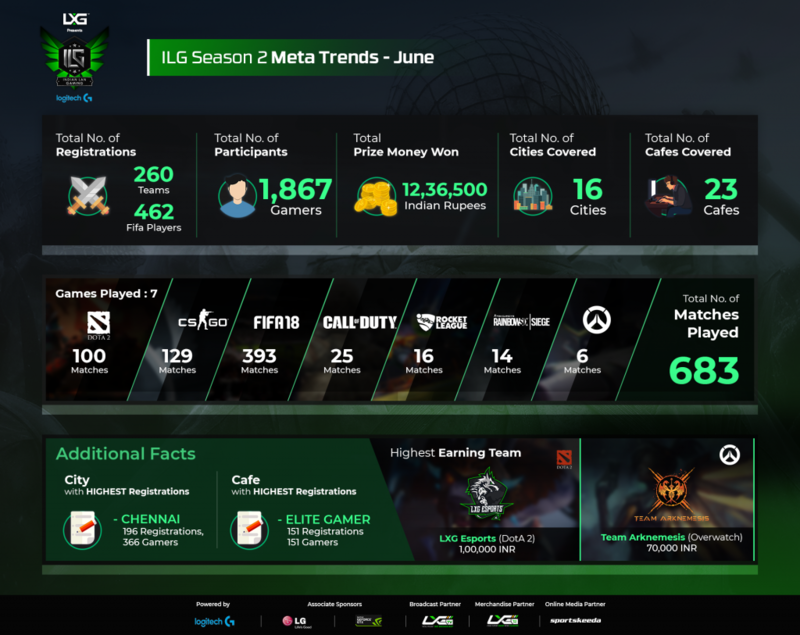 In the 683 games played June has seen a record of 393 FIFA matches played, 129 CS:GO matches, a 100 DotA2 matches, 25 Call of Duty matches, 16 Rocket league matches, and International presence at the last two with 14 Rainbow Six Siege matches and 6 Overwatch Matches played. Chennai takes the lead as city with the highest number of registrations this month with 196 registrations, and 366 gamers showing up to make Chennai proud. Standout cafe Elite Gamer in Chennai ended up as the cafe with highest number of registrations with 151 gamers signing up for FIFA 18. With a huge month comes huge prizepools, and LXG Esports remains victorious on the DOTA since May, bringing home 1 Lakh INR in prize money, and team Arknemesis taking home 70,000 INR for winning the first Overwatch Minor of Season 2. With a lot more competitive LAN gaming coming up, we hope to see more gamers during July! Don’t forget the 1v1 tournaments, happening in every cafe, and for more information on these click here. Bring your team and sign up by clicking here.